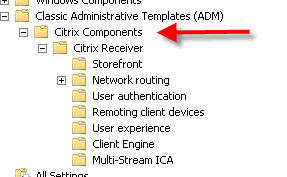 The Citrix client (Citrix Receiver) running on the user’s PC normally uses the proxy configuration of the system. Sometimes you may need to give the client a different configuration: the configuration must be performed in the Windows registry (indeed no control panel or GUI is available). If the PCs are joined to a Windows domain, you can create a GPO (Group Policy Object) to massively configure them.